If you’re trying to improve your ranking in with Google, it’s important that you understand the differences between broad match modifier vs phrase match. It is helpful to equip yourself with a working understanding of PPC marketing. Understanding the differences will help you refine your SEO approach, and ultimately achieve better search rankings. 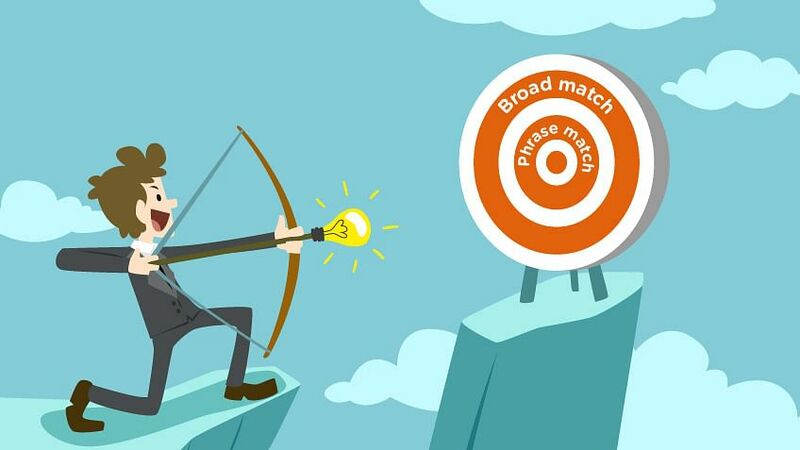 First, let’s clarify what phrase match, broad match and broad modified matches actually are. According to Google Adwords, a phrase match is a keyword setting that lets users find your content when their search includes either your exact keyword phrase or phrases that are a close variation of your keyword/keyword phrase. See how the phrases are similar in all the above examples? Your content would show up in all three searches because the person conducted a phrase match search. In broad matches, your content will be displayed when the search contains at least one of your defined keywords. Google uses a broad match option by default, and it will display results for any combination of words that make up your search term(s). It also returns results for slight variations on your search terms, like synonyms. This might sound great in theory, but there’s a pretty major problem with it: a regular broad match can easily return irrelevant results. That’s where broad match modifiers come into play. Broad match modifiers ensure that your search queries return only results that exactly match the search phrases you’ve specified, or are close variants of them. The plus sign tells Google to make sure the word with the plus sign in front of it shows up in the search query, no matter what. It’s important to note that each of the options outlined above has associated pros and cons. Before deciding to focus on one over the other, we highly recommend that you take some time to evaluate everything carefully since what you ultimately decide can – and probably will – have a very dramatic impact on the results of your SEO efforts moving forward. Learn how to improve the SEO value of your website with our DMCA course. So, without further adieu, let’s take a look at the pros and cons of broad match modifier vs phrase match. Pros – More control over individual search queries means better clickthrough rates and pageviews from more interested customers. Cons – Takes longer to set up individual phrases, and you’ll have a smaller audience reach than broad search matches. Pros – More search volume than phrase match, and less time spent customizing your search phrases. Cons – Less targeted results than phrase match, meaning you’ll have to constantly check your search results against your keywords to identify negative keywords (keywords that drive untargeted, irrelevant traffic). If you have the budget for it, we recommend using multiple match types for your different keywords. By casting a broader net, you’ll get more relevant queries, and the strengths of each search type will cancel out the weakness of the other. While your modified broad match should capture most relevant queries, it might not always capture them (this is usually due to budget, rank, or QS of the actual query). By adding the keyword as an exact match, you can then set higher bids for an exact match than the modified broad words. Look at the actual QS (you might have some queries for the same modified broad match word with a 3 QS and others that are a 10). By adding the exact match versions, you can get better insight into the QS by queries and also view your impression share for your exact match words to make sure you have high IS on your top exact match versions. It’s usually a good idea to add exact match versions of your top keywords. If you’re using automated bidding (or can take the time to look at all the actual keywords), then adding the exact match version of all your words is a good idea. This is a question more of time vs. possibility when you start getting into adding exact match versions of words that only get 20-50 impressions a month. Phrase match is a tough one these days since it often converts about the same as modified broad. If you have word ordering issues (contractor license and license contractor are two completely different items) then you need to use phrase match over modified broad. If you’re using third-party bid technology and therefore have the time to bid on each match-type version, then it can be good to add. If you have a small- to mid-sized account with little technology powering it, then phrase match can often be skipped. In general, a broad modified match is a great option that will nab the most relevant hits and deliver fairly well-targeted traffic. Phrase match doesn’t see as much use these days because it performs about as well as modified broad search, but modified broad search takes less effort. Targeting phrase match queries may not be a good choice if resources are tight. That said, if you’re getting low clickthrough rates and unwanted traffic with modified broad search and need to use something more specific, a phrase match is the way to go. So keep the pros and cons of each method in mind, and don’t be afraid to mix and match as you see fit, according to your goals, needs, and resources. It’s ultimately going to be a judgment call on your part. If you keep these tips in mind, you should be well on your way to improving your search rankings.